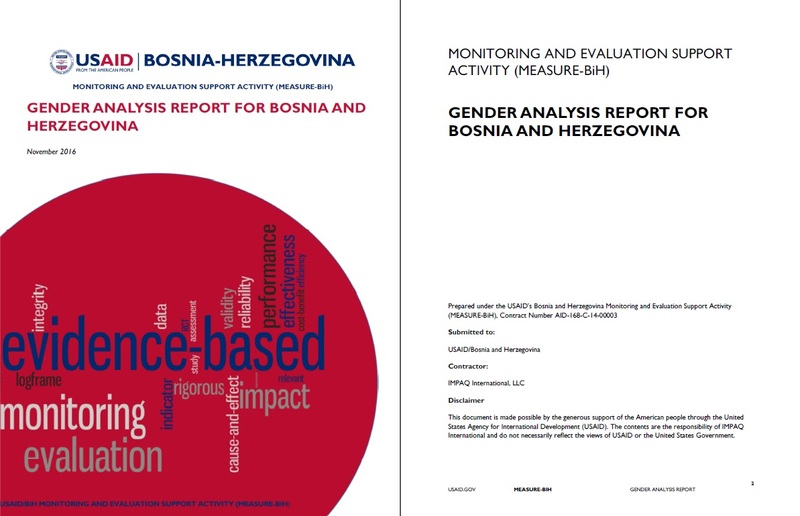 In 2016, the USAID Mission in BiH tasked MEASURE-BiH with conducting the Gender Analysis for Bosnia and Herzegovina, to serve as background material for USAID/BiH in the process of preparation of the next USAID/BiH Country Development and Cooperation Strategy (CDCS). MEASURE-BiH used the following methodology in preparing Gender Analysis: comprehensive literature review, analysis of administrative and other data, 34 interviews and meetings, and attendance at three gender equality events. To what extent do laws, policies, regulations and institutional practices in the CDCS sectors contain explicit or implicit gender biases, or actively promote gender equality? Which cultural norms and beliefs influence the behavior of men and women, their allocation of time, and the gender roles and responsibilities they take on in the CDCS sectors? To what extent do accessibility to and control of key resources and services in the CDCS sectors differ for men and women? Are there differences between men and women in their (or without the, completely) influence over decisions in the CDCS sectors? The report is voluminous and covers six thematic sections: (1) Gender-Based Norms; (2) Rule of Law, Good Governance, and Political and Civic Life; (3) Inclusive Economic Development; (4) Reconciliation and Social Inclusion and Cohesion; (5) Human Security; and (6) Specific Gender Issues. In addition to assisting USAID/BiH in developing new CDCS, this Analysis is also useful to broader audience, as an overview of specific gender equality issues in focus in BiH, as well as yet uncharted areas of concern that require more research (e.g. the sub-sections on women, peace and security, and the role of women in countering violent extremism).